Call me a nerd, but sometimes I love a good scrabble & wine night. It's nice to disconnect from computers and cell phones and enjoy time with friends, a board game and a little imbibing! 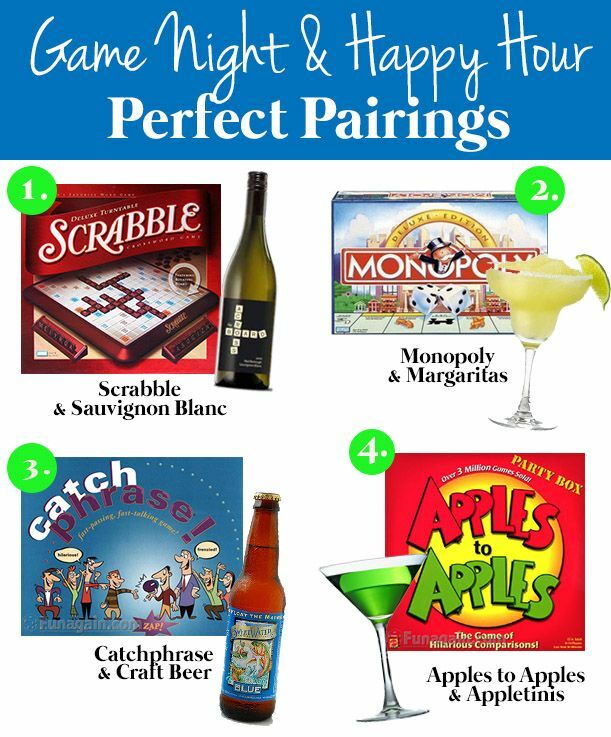 These are a few of my board game & happy hour pairings. Lucky for me I have friends who like doing the same. Break out a board game at your next party, I promise it will provide lots of laughs and an inexpensive night in. I think I need to start a collection of favorites to have on hand when guests come over. So fun! I need to purchase Apples to Apples for myself and stop stealing my parents' game! I loveee board games! Apples to Apples is a fave of mine. My family absolutely loves scrabble too! I love a good board game! I have a bunch in my house, more than I like to admit sometimes. OMG, I definitely want to do a game/drinks night now! Monopoly and margarita's sounds like a perfect night in. This is so cute! Would be a good idea of stuff to bring/ a hostess gift for a girls' night, too! LOVE game night, my current favorites are Adult Loaded Questions and Cards Against Humanity! Lauren these look really fun! I've always liked pictionary the best.